London, Royal Academy of Arts, Picasso: Painter and Sculptor in Clay, September-December 1998, no. 181 (illustrated in colour). This exhibition later travelled to New York, Metropolitan Museum of Art, March-June 1999. This work is comprised of 66 earthenware tiles, each measuring 6 x 6in. (15 x 15cm.). One of the largest and most important ceramic works that Picasso ever made, Jeu de Cirque is a magnificent frieze full of energy and life on the theme of one of the artist's favourite and most enduring themes - the circus. Executed in 1957, this unique mural was dedicated and given to Picasso's friends Huguette and Jean Ramié in thanks for their many years of help and instruction at the Atelier Madoura in Vallauris where he had first learned the techniques of ceramic working. The Atelier Madoura was an ancient pottery with an original wood-fired kiln which, since 1936, had been run by Jean Ramié's parents Georges and Suzanne. It was from them that the workshop took its name - "Ma" from maison, "Dou" from Suzanne's maiden name of Douly and "Ra" from Ramié. Picasso first visited the Madoura workshop in Vallauris on the invitation of Georges Ramié in 1946 and was immediately attracted by the flexibility of clay and the unusual combination of pictorial and sculptural possibilities that it offered. He was also moved by the ancient associations of the village of Vallauris which had been a ceramic centre since Roman times and particularly inspired by the atavism involved in emulating the primeval practice of fashioning vessels out of this ancient earth. The many complex skills involved in the ceramic medium took some time for Picasso to learn, but, typically, as soon as he had mastered the techniques involved, he set about reinventing them by mixing glazes, slips and oxides in an unorthodox way and observing their transformation in the kiln. 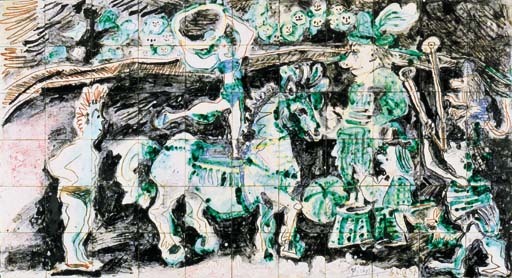 Jeu de Cirque is a work that in many ways represents the technical culmination of Picasso's mastery over ceramic technique. Using a complex combination of glazing techniques and oxides, this elaborate mural underwent a number of firings before Picasso was happy with the end result. The work also incorporates the playful use of ceramic pastels which as Suzanne Ramié has recalled, Picasso evidently delighted in using because of their ability to convey the immediacy and fluidity of drawing in a ceramic medium. The complexity and sophistication of the techniques employed in Jeu de Cirque is appropriate given that from the outset, the mural was intended as a gift to hang in Jean and Suzanne Ramié's house. Its subject matter - clowns, animals and acrobats performing in a circus ring, was one close to Picasso's heart, but was also clearly chosen to be an entertainment for the four Ramié children. The characters and composition of Jeu de Cirque can in some ways be compared with those of a suite of drawings published in 1954 under the title Picasso and the Human Comedy. In this remarkable series Picasso had expressed his own sense of dejection at Françoise Gillot's departure from his life through the tragi-comic carnival atmosphere of the circus. In contrast, in Jeu de Cirque, the manifest sense of 'joi de vivre' expressed in the smiling faces and comic posing of the circus performers, and the evident delight Picasso has taken in the execution of their frenetic outlines and his bold splashes of coloured glaze, clearly endow the work with an altogether different feeling. An overt celebration of life, Jeu de Cirque was evidently intended by Picasso to be an entertaining and inspiring frieze that would infuse a sense of gaiety and well-being into the house where, until recently, it has always hung.